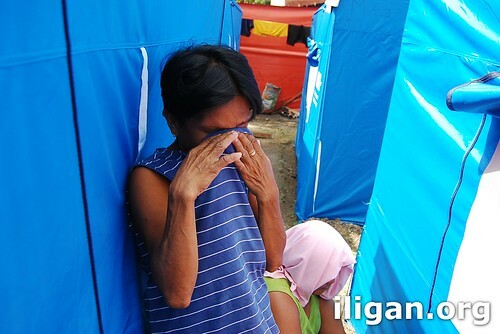 In every unfortunate events such as Sendong, depression grips those who were directly affected. But depression does not only confine within the affected, even those who live several kilometers away from the flood site. I too had occasional depression every time I hear the sad stories of the victims. Hearing stories of survival from the Sendong survivors somehow inspires me. Gone will be depression or at least overcome by the stories of the people below. I was in the commencement ceremony of the GK housing project for Sendong survivors in Sta. Elena. One of the survivors Joanne Valdez was invited to speak about her experience. After her talk, I approached and asked her again a few questions and told her if I could interview her again the following day. We both agreed that we meet at the evacuation center in Sta. Filomena high school campus in the morning. I arrived around 10:45 am, but for some reason she was not there. Instead I met these two women whose tent just stood nearby Joanne’s. They told me of their lack and frustrations, but holding it back a bit when I told them I’m just a volunteer. But I did tell them that VP Binay through City Hall is giving P3,000 financial assistance to small business owners who were affected by Sendong. They offered me a monobloc chair to sit on, I refused, I don’t want to feel special, survivors should get special treatment. Erlinda Torres and her daughter Loyla Nangcas agreed to be interviewed. They asked me a few curious questions, I noticed in their questions that they were frustrated and needing a lot of help. Relief goods were not enough for them. They lost practically everything. They want to sell Balut again, but currently don’t have the money. Erlinda Torres cries as she recounts what her husband went through during the flood. He was found alive the following day Sunday at 2pm in Dalipuga, about 8 kilometers from Bayug Island. Erlinda told me that her husband saw the much talked about “huge ship surrounded with lights”. She said, he closed his eyes and when he opened it, the ship was no longer there. She wants to go back doing business again. Before the flood, she used to sell vegetables at the market by day, and balut at night. 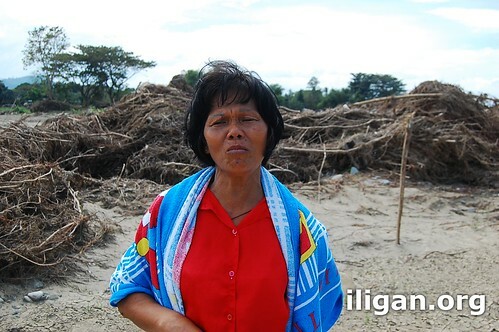 Her daughter, Loyla Nangcas is married and has one daughter, her husband and only daughter survived. Loyla’s husband was temporarily swept by the flood, but got hold of a coconut tree. He also saved two kids, all three of them hugging the coconut tree for 12 to 13 hours, waiting for the flood to recede. The flood started at 1:00am. So probably they climbed down at 2:00pm. Wow, that must be exhausting. I admire their will to survive. She, her daughter and mother ran to the highway, and was blessed to climbed up to a two storey office located just beside the road. Just like her mother, Loyla wants to sell balut again, her husband’s temporary job of quarrying sands at Bayug Island only earns them 100 day. She used to earn more than 200 pesos a day selling balut at Mindanao Sanitarium and Hospital, near Mackies in Tibanga. 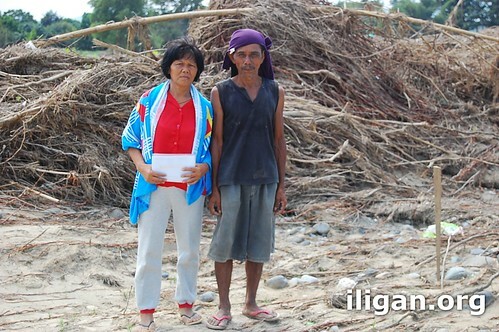 They were both kind and willing to grant my request to go to the site of their homes in Bayug Island. Erlinda Torres standing on where her house used to stand. 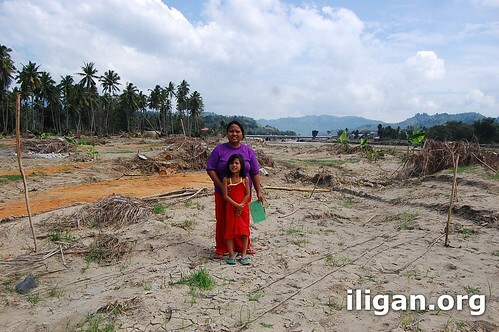 Loyla Nangcas and her daughter standing on site of their wiped out home. See the two sticks on their right and left? It is to used as a marker. Her daughter is scared to go back to school, the flood has a significant effect on her. Primitiba caught us up in Bayug Island. She is also lives in the tent city at Sta. Filomena high school. 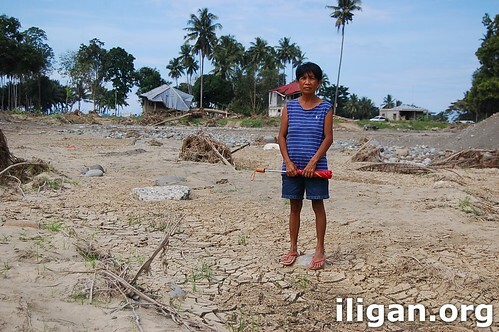 She and her husband Ricardo were swept by the wild flood, and landed in Manticao, Misamis Oriental. That’s probably 30 to 40 kilometres away from Iligan City. As she was riding in the wave, she prayed, “Lord, please e likay ang mga troso!” and the raging big trees would miraculously evade her. She too saw the ship along Mandulog river. Her mother in law and granddaughter is currently missing. Primitiba and Ricardo Emoborong standing on their former homes. Ricardo took a quick break from quarrying the sand nearby, just for this shoot. The neighbours of Purok Duranta, Bayug Island. Let’s rebuild their lives and homes. Any help is very much welcome. 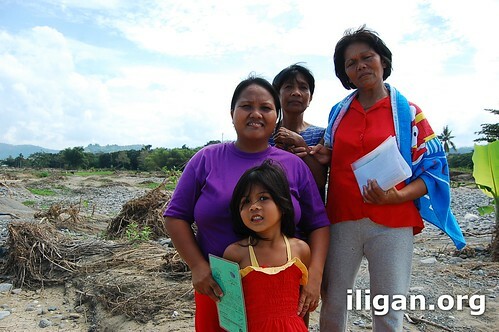 Donate to One for Iligan and volunteer for Gawad Kalinga.